Tile, John Sadler, 1757-1761, Winterthur Collection. The tale goes that a one eyed doe was grazing along the shore, with her one good eye turned inland. Her disability blinded her to the archer who shot her from a boat. The moral being that one cannot predict fate. 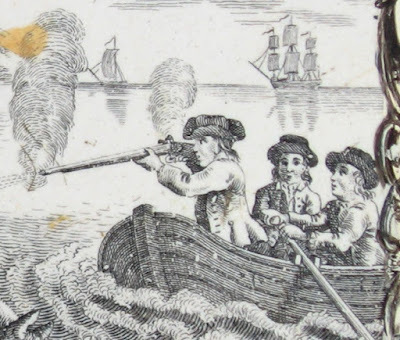 Sadler updated the story with sailors (presumably from the sloop or ship offshore) who shoot the doe with a musket, rather than a bow. The sailors wear single breasted jackets with drop down collars. The oarsman is wearing open mariner's cuffs. All three wear loose hair cropped to the shoulders and round hats with the brim turned up. Sadler was clearly no sailor. The oarsman rows facing the bow, and the ship and sloop are rather crude.